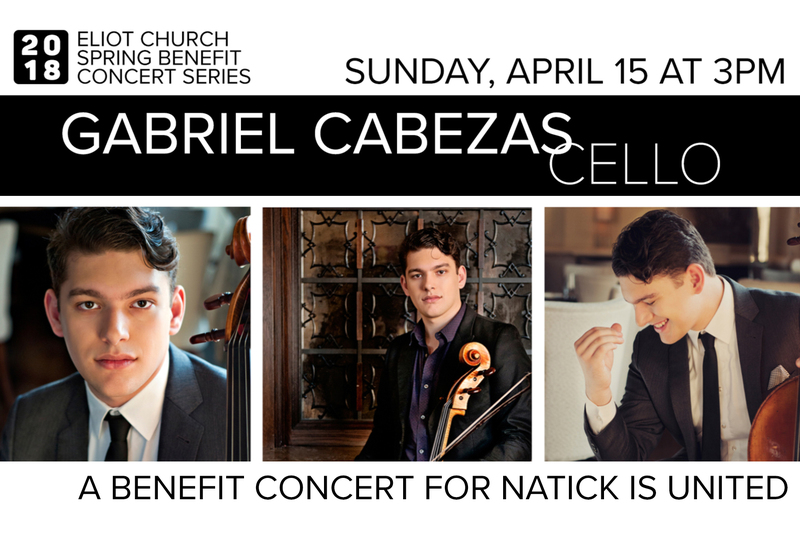 For the second of our two Benefit Concerts for Natick Is United, The Eliot Church is excited to welcome Gabriel Cabezas. “An intense player who connects to music naturally, without artifice, and brings a singing line to the cello” (The Oregonian), Gabriel Cabezas is one of America’s most sought after young musicians. Cellist Gabriel Cabezas has appeared as soloist with the New York Philharmonic, Los Angeles Philharmonic, Chicago Symphony, The Philadelphia Orchestra, Cleveland Orchestra, Houston Symphony, Orquesta Sinfónica Nacional de Costa Rica, Pittsburgh Symphony, Detroit Symphony, New World Symphony, and the Nashville Symphony. He is a member of the New York sextet yMusic, hailed by NPR’s Fred Child as “one of the groups that has really helped to shape the future of classical music”. Their virtuosic execution and unique configuration (string trio, flute, clarinet, and trumpet) has attracted the attention of such high profile collaborators as the Dirty Projectors, Ben Folds, and Paul Simon, and inspired an expanding repertoire of original works by some of today’s foremost composers. Cabezas is also the co-founder of Duende, a new music and contemporary dance collective which focuses on the interaction between performers and dancers in the live realization of new scores. A committed advocate for community engagement and education programs across the country, Gabriel received the 2016 Sphinx Medal of Excellence, a career grant awarded by the Sphinx Organization to emerging classical artists of color, who, early in their professional career, demonstrate artistic excellence, outstanding work ethic, a spirit of determination, and ongoing commitment to leadership. An enthusiastic chamber musician as well as soloist, Gabriel has performed and toured with artists ranging from bassist Edgar Meyer to songwriter Gabriel Kahane to the musicians of the Marlboro Festival. Cabezas studied at the Curtis Institute of Music under Carter Brey. This is a PUBLIC EVENT for ALL AGES.